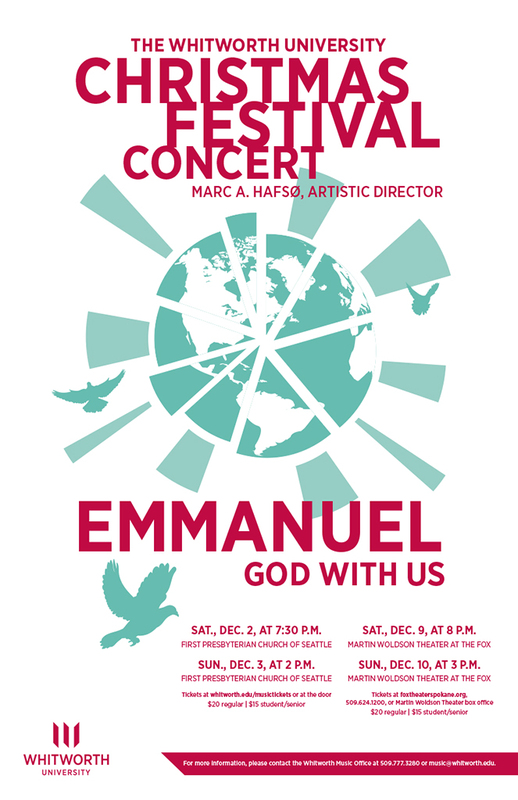 Whitworth Choirs to Present Christmas Festival Concert, "Emmanuel: God With Us"
The 2017 Whitworth University Christmas Festival Concert, Emmanuel: God With Us, will take place in Seattle on Dec. 2 and 3, and in Spokane on Dec. 9 and 10. The concerts will feature more than 100 student-musicians, including members of the Whitworth Choir, the Whitworth Women’s Choir and the Whitworth Men’s Chorus, as well as student instrumentalists and narrators. The concert theme will be elevated through choral works, readings and traditional carols for the audience and choirs. Presented without interruption, the ever-popular concert will be concluded in candlelight. 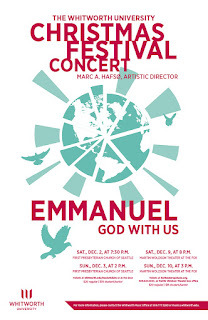 Featured works will include David Danner’s powerful setting of Arise, Your Light Has Come, and carols for audience and choirs including David Willcocks’ joyful setting of O Come, All Ye Faithful. Saturday, Dec. 2, 7:30 p.m.
First Presbyterian Church of Seattle, 1013 Eighth Ave.
Saturday, Dec. 9, 8 p.m.
Martin Woldson Theater at the Fox, 1001 W. Sprague Ave.
Tickets available at the Fox box office, (509) 624-1200 or foxtheaterspokane.org. A limited number of tickets may also be available for purchase at the door prior to each concert.